The Nats signed Joe Blanton to round out their relieving corps today, so let’s start with that piece of it. The biggest thing about this signing isn’t that they specifically needed Blanton, or someone just like him. It’s the gravity of acquiring another capable reliever to add weight to a potentially strong, but thin bullpen. I’ve said it before, that if everything worked out well with health, their bullpen is more than fine, it’s probably quite good. But if one or two guys get hurt, or fail to live up to expectations, things would go south quickly. Blanton gives them serious insurance that one injury doesn’t turn 2017’s bullpen into a replay of 2015’s. 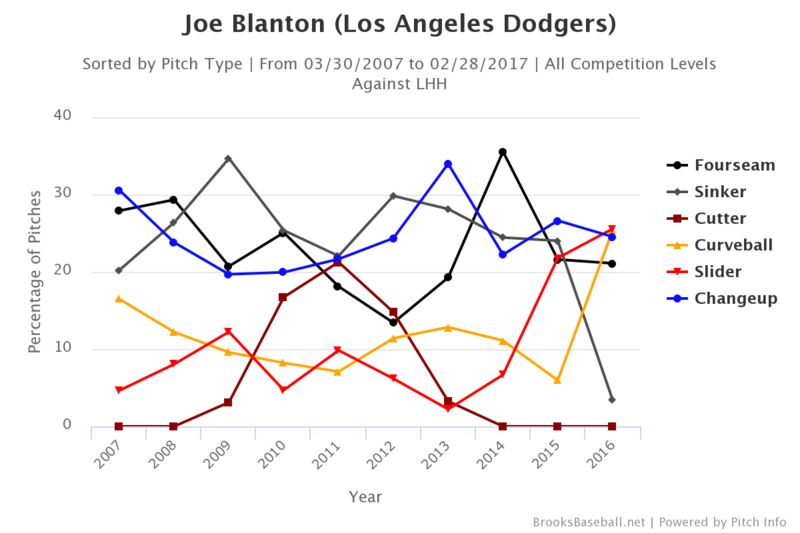 That being said, let’s take a look at Blanton, who is much more than just bullpen injury insurance. Despite what you may remember from his days on the Phillies, he’s actually pretty darn good. The key to Blanton’s success has been his move to the bullpen. He has been a really really good reliever. In 2016, he ranked 28th in ERA, 20th in WPA and 28th in RE24 among the 129 relievers with at least 50 IP. This basically puts him in the upper echelon of non-closers, at least in terms of results. So why was he so good as a reliever? If you want to look at his selection versus lefties and righties, you can, but they basically show the same trend. He has limited the pitches he uses, but it’s not like he’s a 2-pitch pitcher now. He’s only down to about 4 pitches against lefties, 3 against righties. Blanton has pretty much abandoned (especially last year) any fastball other than his four-seamer. 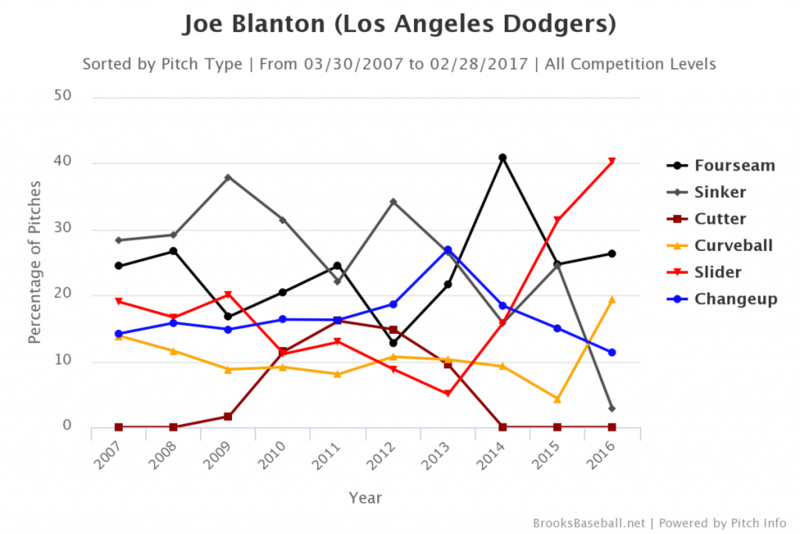 This is interesting only because Blanton was a sinkerball pitcher for most of his career, and last year he basically abandoned it. He relies heavily on his slider now, to the point that it’s his primary pitch. The fact that he was able to do that and still keeps his walks down suggest how effective it is. He uses his curveball quite a bit as well, and both of these pitches he uses against hitters on either side of the plate. The changeup is basically reserved for lefties. Last season, Blanton threw his offspeed pitches 70% of the time – this is not a common thing, even among relievers. According to fangraphs, among all pitchers who threw 50 IP+ last season, Blanton threw fastballs at the 7th lowest rate. But that’s not even really right – that includes people like Mark Melancon and Bryan Shaw, who are relying on cutters instead of fastballs, and R.A. Dickey and Steven Wright, who are knuckleballers. If you count cutters as fastballs, and remove the two knuckleballers, then Blanton threw offspeed pitches at a higher rate than anyone in baseball. And it wasn’t close. 70% of his pitches were offspeed, next was Andrew Miller, who threw them 60% of the time. Then you get to AJ Ramos, Lance McCullers and Kenta Maeda, who each threw them 57% of the time. It wasn’t nearly as pronounced in 2015, when he threw his sinker, too. He was only throwing offspeed about 51% of the time, which ranked him 24th (in a list that again includes Dickey and Wright). My question is whether or not he’ll stick with this rate. He was really effective last year, but he walked more batters than usual. The thing is, that’s a 2.9 BB/9 rate. It’s still really good, and his K/BB ratio stayed above 3. You may see him mixing a few more fastballs in here or there, but I’d suspect he’ll wind up in the top 10 of that offspeed usage list again. And that’s because batters have trouble hitting the offspeed stuff. While his opponents’ swing rate has essentially remained the same against him, last year they swung and missed at his slider at a higher rate than he had ever achieved in previous seasons. And if you look at just righties, it was even more pronounced. 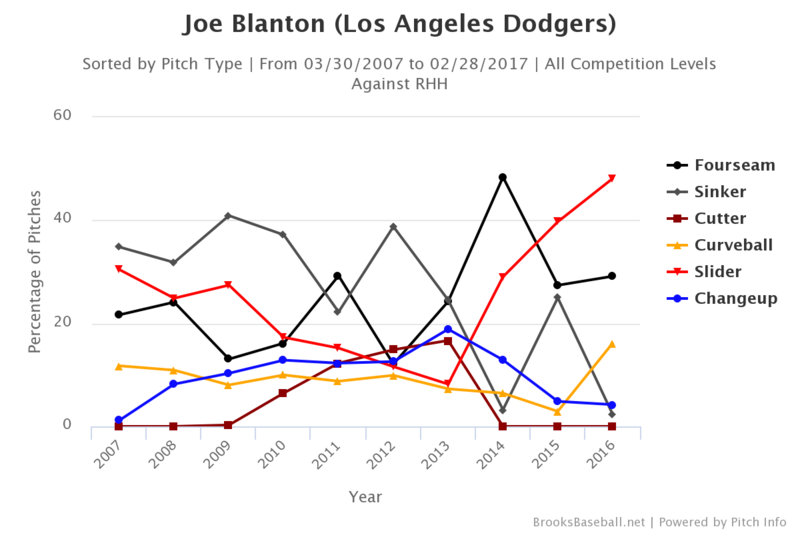 The increased use of the slider, as well as the changeup against lefties, has turned Joe Blanton the reliever into something Joe Blanton the starter never was – a swing and miss pitcher. Look, it’s not like he never struck anyone out before the last two years, and Andrew Miller he aint. But he went from a career 6.5 K/9 guy, with his best years results-wise on below that (when he was all about the sinkers) to a 9.0+ K/9 gut the last few seasons. He’s turned himself from a primary sinkerball/fastball pitcher into a primarily slider/offspeed pitcher, and in doing so he’s turned himself from a fading, mediocre starter into an effective reliever.